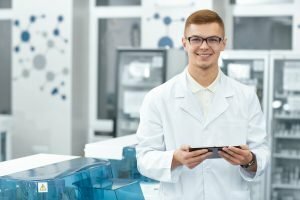 Is an Apprenticeship in Science or Healthcare right for me? Young people always say to us “I don’t know what I want to be when I grow up”, well, neither do we. But what we do know is that an Apprenticeship will give you confidence and skills that you will use for the rest of your life. Simple, you get to learn and gain formal qualifications whilst you earn a salary and in turn you will grow, increase your self-confidence, develop a network of contacts, have fun and make friends for life, what’s not to like? Many people still think that young people only do an Apprenticeship if you are not smart enough to go to University. Not true. Many of our young learners are A* students who felt that University right now wasn’t the best option for them. They wanted to take some time to figure out what degree they might like to study in the future, build their confidence and develop new skills. Some of our Apprentices have now received funding from their employer to help pay for University further down the line. Your apprentice qualifications count towards your UKAS points. Other Apprentices have gone onto to study for other apprentice qualifications, did you know Apprenticeships now go all the way up to Level 7 which is the equivalent of a degree. 90% of our learners are offered jobs in the organisations they have been working with, it’s a great opportunity but you have to grab hold of it with both hands. Some of our learners join schemes from age 16, they recognise that a college or 6th form environment isn’t right for them. Some young people join after completing BTEC’s or A-Levels. Many of our Apprentices have said they learn better from working alongside world leading experts, absorbing information as they go, they prefer work to a school or college environment because they are treated like adults. They like the networks they have built and the contacts that can help them in the future. They enjoy being ambassadors for their employers, by encouraging the next generation to go into a STEM career – this is called Outreach. Am I right for an Apprenticeship? Apprenticeships are a hot topic right now, the Government is encouraging organisations and businesses to take on many more Apprentices over the next few years particularly in Science, Technology, Engineering and Maths (STEM). Businesses recognise the positive impact that Apprentices have on their workforce, Apprenticeships fill skills gaps that can fill roles in the future – this is called “talent pipelining”. They breathe life into an organisation and businesses have told us that they learn just as much from the Apprentices as the Apprenticeships do from them. What kind of role might I do in the future? If you undertake an Apprenticeship in either Science or Healthcare the world is your oyster, some of our recent learners have been offered roles as: Assistant Research Scientist, Environmental Scientific Analyst, Wind Tunnel Technician, Laboratory Technician, Analytical Chemist, Forensic Scientist, Assistant Technical Officer, Medical Laboratory Assistant.